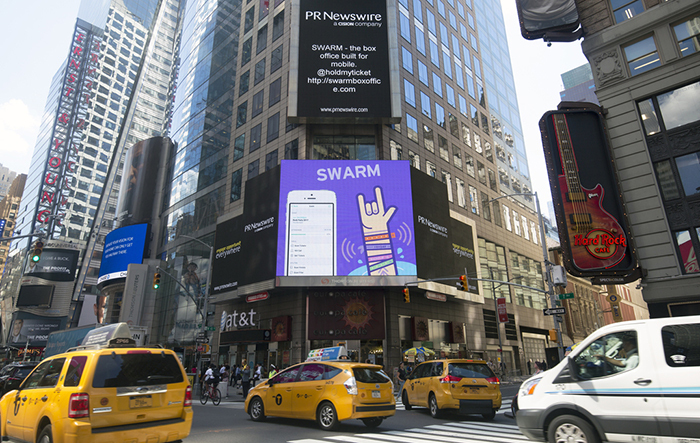 The team is proud to announce our newest app release, Swarm2. Since 2008 HoldMyTicket's box office app, Swarm, has served our clients around the US and across continents, and has powered our box office here at our Albuquerque headquarters, where we provide phone and walkup sales and customer support for your events. We've heard all of your feature requests for Swarm, and decided it was time for a revamp to make it functional for every type of event environment. We believe Swarm2 is the solution to all of your box office needs. We wanted to make Swarm available to everyone, and we don't want you to have to have extra hardware if you want to make a simple sale or check someone in. We've also put everything that used to be desktop-only into the mobile app, so regardless of where you are and when, you can get s*** done. Check it out, we're at Times Square! Thank you for being a user of HoldMyTicket. This app is built for you, so what are you waiting for? Get your upgrade on. 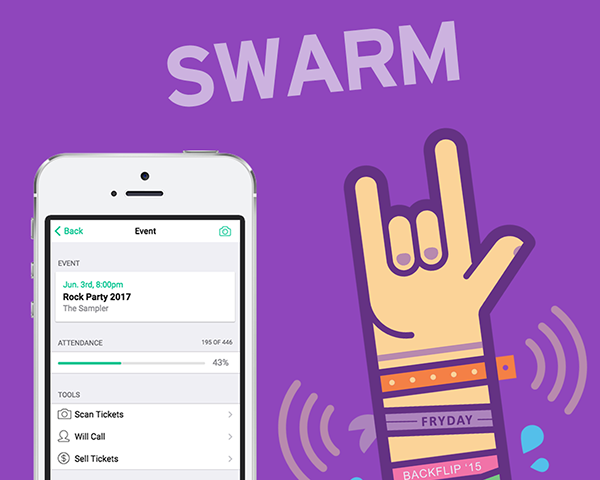 ALBUQUERQUE, N.M., June 20, 2017 /PRNewswire/ -- HoldMyTicket LLC announced today that it has rolled out a significant update to its mobile box office solution - Swarm, which is currently used by over 750 organizations and powering millions of events nationwide. Recognizing the importance of a 'mobile-first' experience, HoldMyTicket offers a robust yet easy-to-use mobile box office solution. 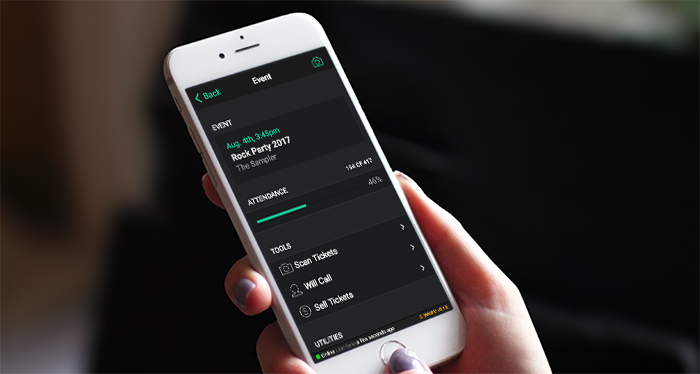 "We're excited to provide a mobile box office solution that can be used for any type of venue or event," said Wes Edling, Founder and Chief Executive Officer of HoldMyTicket, "By packing tons of features and focusing on a beautiful user experience, we are confident that Swarm 2 is the best mobile box office available." See Swarm 2 in Action! Swarm 2 (available for free in the App Store for iOS and the Google Play Store for Android) scans and validates tickets of any form, processes credit, cash, and comp transactions, assigns reserve seats, and communicates event attendance and sales reports in real time. Swarm 2's offline mode ensures that your event operates smoothly, even without a reliable network. The app can use a device's native camera for scanning and card reading, and also integrates with external hardware, such as laser scanners, credit card swipers, and thermal ticket printers. The result is an overall expedited event-entry process. "Providing the best event experience for everyone is what drives us every day, whether you're managing an event or simply looking to purchase a ticket - we want to make an impact on that experience," said Wes Edling, "There is a problem with the way existing ticketing companies interact with their clients and ticket buyers - fees, user experience, and outdated software all play a factor." 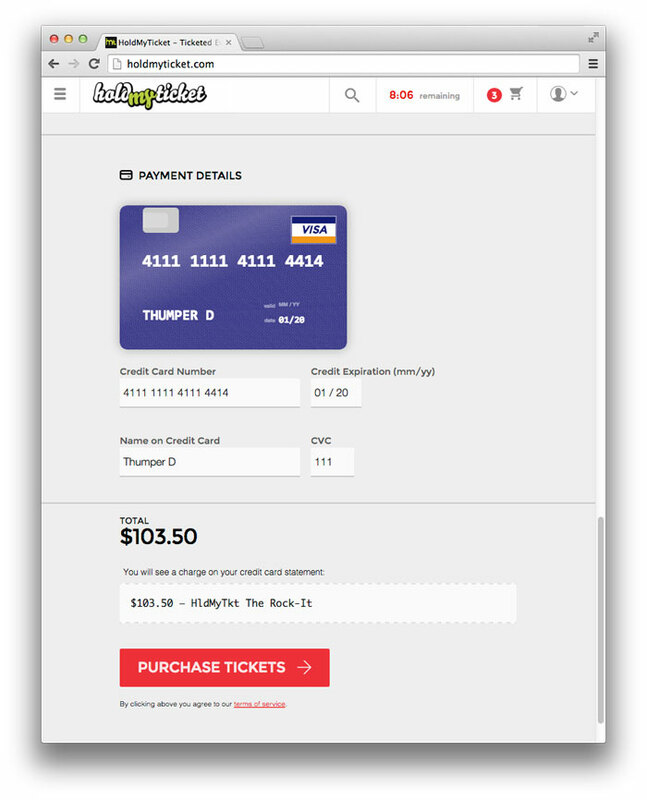 HoldMyTicket is a full-scale ticketing platform designed with a mobile-first mentality. In a mobile driven market, you have seconds to captivate a buyer and finalize the ticket sale on a mobile device. Most ticketing checkout processes are cumbersome, clunky, and not built for mobile devices. In addition, most require the creation of an account to complete the purchase, making the ticket buyer remember yet another username and password to purchase a ticket which is beyond frustrating. Unlike other systems that aren't keen on providing a better solution, HoldMyTicket aims to create the best experience for both its partners and ticket buyers. "Our goal is to continue building a ticketing company that both our partners and end-users love," said Eric Griego, HoldMyTicket's Vice President of Business Development. "Every partner of ours leverages HoldMyTicket differently, we don't fit a square peg in a round-hole. We understand that each venue or event has different needs but one ultimate goal - to sell tickets. Our team and software accomplish that." Looking ahead, HoldMyTicket is expanding their membership offering, digital wallet capabilities, and strategic partnerships. We're updating our look. New ticket stock is in! We just restyled our printed tickets! 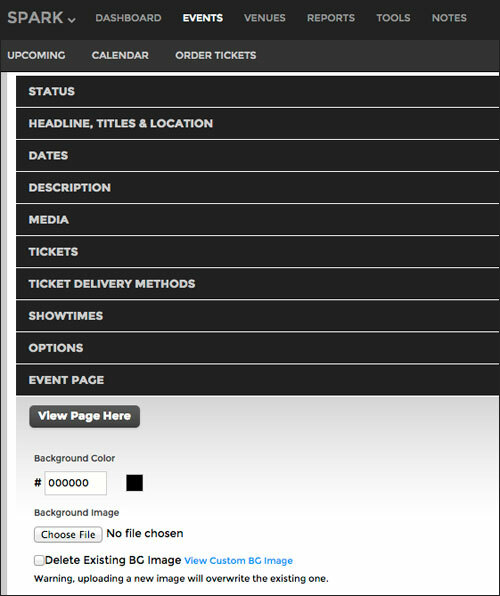 We've made hard tickets more informative, with a more classic look. 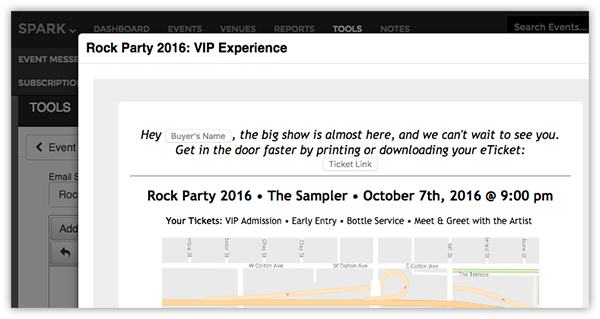 The ticket comes pre-filled with all of your event details, and with room for four more lines of your own text, or an image that you can upload yourself. Seating details are now optional, the QR code is bigger, and the stub has more core event details, including the ticket details (under advanced options in the ticket editor). Can't wait to have some of these in hand? Click here for tips on how to order printed tickets today. Or, if you have a BOCA or STIMARE ticket printer from HoldMyTicket and some of our original ninja stock, contact us when you're running low so we can schedule a transition for your box office. This update aims for better legibility, easier scanning, and more flexibility for you. We'll be releasing more and more updates, so keep your eyes peeled for new developments. We hope you enjoy the new design! 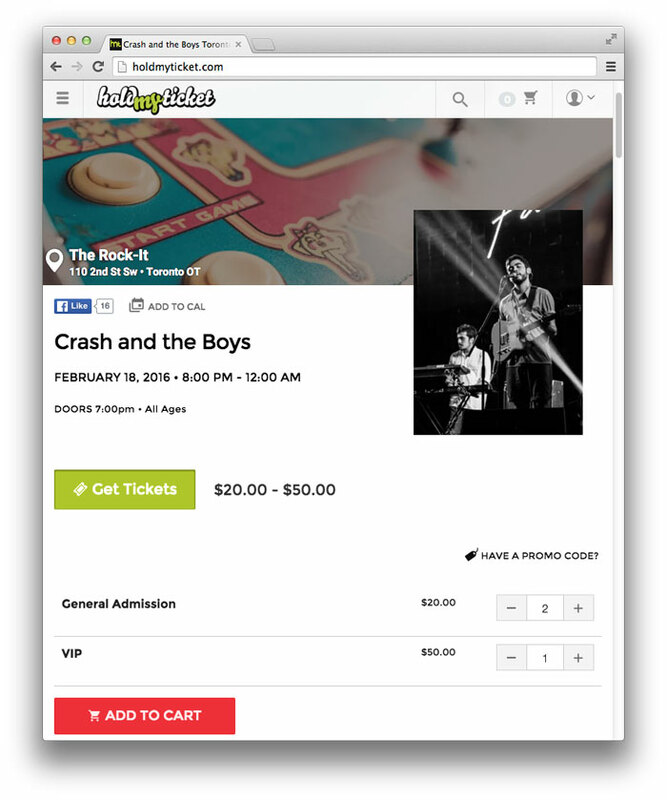 HoldMyTicket is announcing its first back-end booking assistant for venues and promoters. 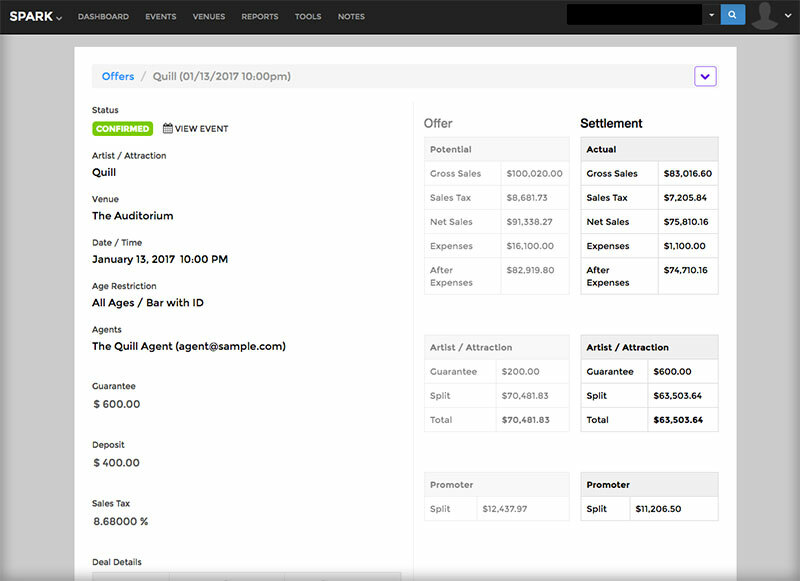 The new Offers & Settlements tool in the SPARK Event Manager is how you can create, email, and settle deals with artists and their agents. Choose a Guarantee-Versus or Guarantee-Plus offer, and account for ticket sales, additional income, taxes, and expenses, calculated based on fixed amounts or percentage of sales. You can also compose templates to speed up the process for similar future bookings. Create the event in Spark directly from a confirmed offer. As soon as ticket sales have stopped, a final settlement will be generated for you, accounting for your online and box office ticket sales. Email the settlement back to the agent or print it out on the spot. Add simplicity and structure to your talent agreements, forget the math and human error, and make counting ticket stubs a thing of the past. 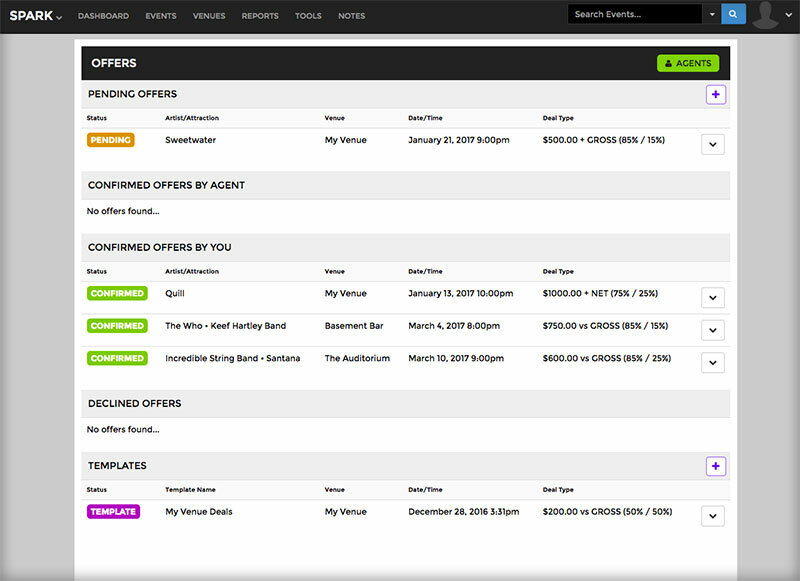 Offers and Settlements is integrated with HoldMyTicket's SPARK Event Manager and SWARM Box Office. Get started with HoldMyTicket today. We're improving the before, during, and after of your event ticketing. Our most recent updates are going to help you better promote your event, track your sales, relate to your customers, and, wait for it...get paid. Embed your entire event page on your site - sacrifice nothing! See our help doc on using the embed tool. Sold all the tickets already? You may be familiar with our event messenger - the best way to contact your ticket-holders with important information before your show. We know you appreciate your show-goers and want to provide the best experience possible, so the messenger just got more personal. You can now input the buyer's name and their eTicket link into the email. Help them feel taken care of, and feel assured that more of your customers will reach the front of the line with their tickets in hand. Selecting email recipients is more precise than ever. 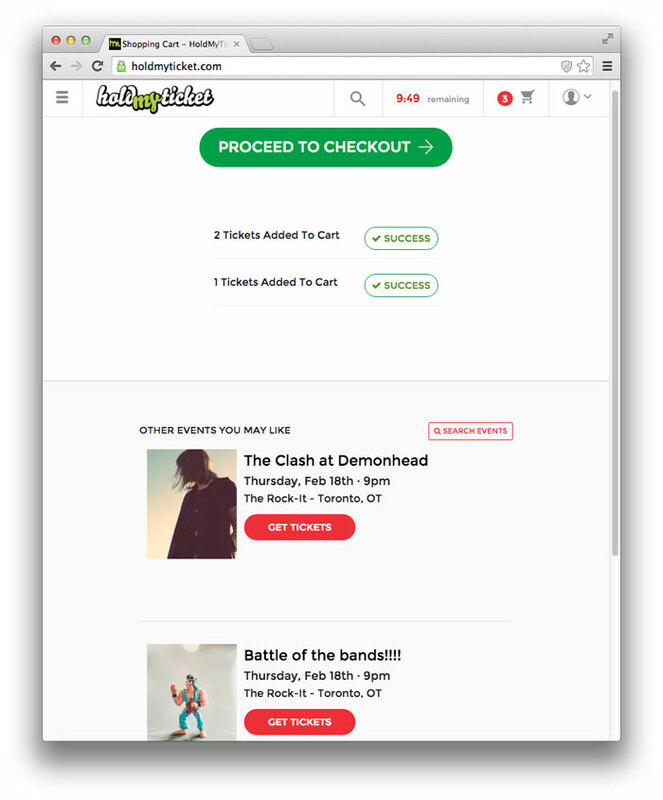 You can filter ticket-buyers by ticket type and delivery type, and save a draft or schedule a delivery time for your email. Learn more on using the event messenger here. Improve your next event by keeping track of how sales went last time, and the time before that, and before that. View any two to five event reports in our new event comparison format. Ticket sales and page view timelines for each event are laid on top of one another, and you can view all other details of your event report - sales by transaction type, by face value, by channel - side by side. At a glance understand how your marketing compares across events. Learn more about how it works here. Our event tracker had a bit of a makeover. Now you can more easily share your sales numbers with affiliates while maintaining the privacy of your Spark account. The interface also lets you subscribe yourself or others to event audits, emailed daily. Click here to learn how to use it. Ordering printed tickets is now hassle, delay, and head-scratch free. 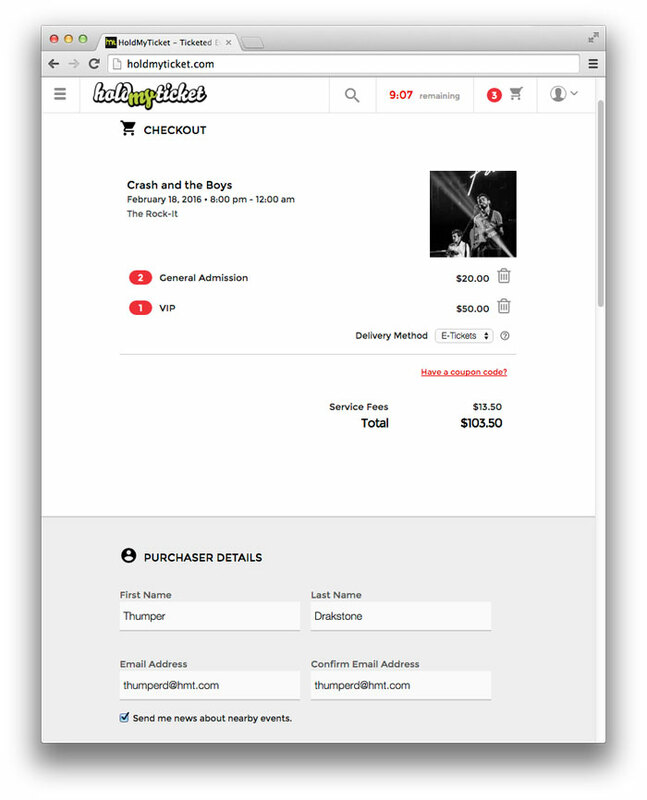 The new order form helps you manage your ticket's availability and ticket text, with more powerful cart management and a Pay Now or Pay Later option. 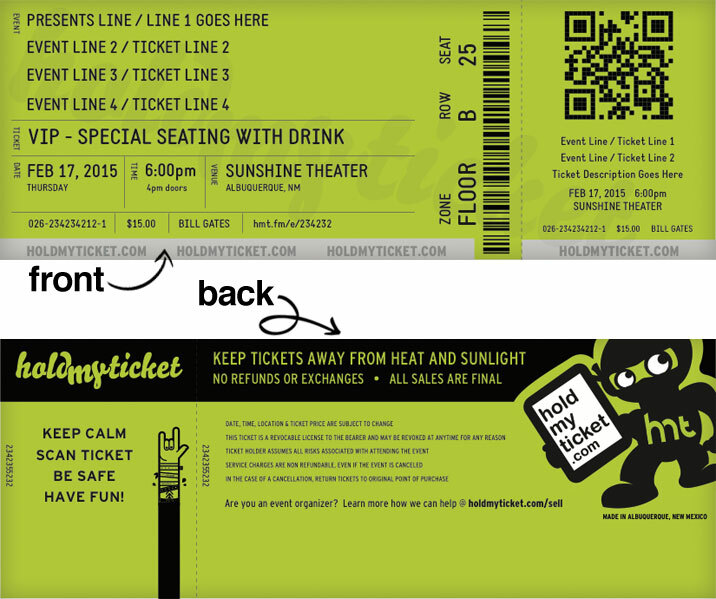 Click here to for an introduction to ordering printed tickets. No more $3 E-Payment Process Fee. Direct deposit payouts are now completely free. Enjoy receiving every cent of your earnings, no strings attached. Turn up the volume at the bottom of Spark and hear your sales come in. Sounds sweet, doesn't it? We can’t get enough of Pokémon GO at HoldMyTicket. Seems like someone's always luring Pokémon here to the office. It's gotten us on our feet more often for a coffee break or a walk around the block. The hype of this game is still very real. Procrastination aside...did you know Pokémon GO could also bring more people into your venue? Your spot could be THE spot to play! Pokémon GO launched a few weeks ago for free on iPhone and Android. It achieved over 30 million downloads as of last week and now is in 31 countries. Check out these stats of the game blowing other social media apps out of the water. PokéStops: Checkpoints at places of interest like notable buildings, art installations, and monuments around town. They're used to power up and collect special items that help players catch Pokémon and advance their trainer level. Gyms: Larger checkpoints where players battle their Pokémon. These places are less frequent around town and are generally well-known establishments within a community. Players tend to spend more time here. If your establishment is a Gym, you're in luck. Lures & Lure Modules: Items that can be placed on a PokéStop for a duration of 30 minutes to attract Pokémon who are hiding in the area. Lures are free and are earned from gameplay. Lure Modules, which are much more powerful, can be purchased in the app for 100 PokéCoins (99 cents). Interestingly, there isn’t a marketplace for businesses to tap for ad placement yet. You have to set yourself up as a player and have access to the same stuff that any regular user buys. Creatively, you can still market this way. You just have to play the game. Lures have about a 15-meter radius. If your venue is near any notable art installations or landmarks there's a good chance there is a PokéStop and players near you, and you can use a Lure. Any players can see your username stamped on the Lure. It's a cool social element where you're acknowledged for your well-spent 99 cents. A word of advice: make your venue's name your username so people recognize you. A technique called farming lets you utilize areas that have a lot of PokéStops to place multiple Lure Modules at once and draw an unavoidable amount of Pokémon into that area. Be open to the game. Offer rewards. Fortunately, you're facing a prime audience for live events! You're drawing in young people who are already out and about. Especially if you're farming, players are doing some high-intensity catching. They're earning the break time to migrate to your establishment and enjoy your show. Use the hype of Pokémon to advertise, and don't forget the personal touch of your venue. Rock bar? "We only accept Rock types here"
If you are near that Pokéstop, advertise it! Clear and simple. There. Are. Pokémon. Here. If you have plentiful Pokémon inside: Do a photo contest at the event. Players have to snap the best shot of a Pokémon at your venue, then tag your venue on Instagram. Reward them later on your social media with tickets to another show, or see if the band would want to join in by announcing the winner onstage and do a meet & greet. If you're in a Pokémon dead zone: Mobilize. Place Lure Modules at other locations with high Poké-traffic and place offers there. Use a poster or flyer that has a QR code that leads to promo tickets. Spread the word via social media or newsletter: “We’ve placed some lures around downtown. Catch Pokémon and find our flyer. Scan the code for $5 off tickets! Valid from 7-10 pm tonight!" Attention all walking city tours, trolleys, and nature hikes: Chances there are already Pokéstops on your tour! Do you focus on historical buildings, murals, or nature spots? So does this game. You and GO share the goal of shedding a new light on a city or area, which is great! Just embrace that, at moments, the group's attention may shift from the history of this 100 year-old building to the Zubat in the tree next to it. Make sure everyone can play. Invest in a mobile hotspot and get everyone on your wifi. Carry a mobile USB charger so players can charge their phone if they're running low on battery. Help them level up and pause the tour when a rare Pokémon appears. A member of the group’s egg just hatched in its incubator? Celebrate! Pokémon GO PLUS, the game's bluetooth accessory, is releasing at the end of this month. If you’re really feeling generous purchase one and reward the person with the most Pokémon caught by the end of the tour. If you’re fortunate enough to have a PokéStop or a Gym on location, make that your event! It's a perfect theme for your more low-key event coming up - maybe your weekly karaoke night. Promote: Add a Pokémon-themed twist to your usual flier and make it known that this is a special event for players. Place Lure Modules for the span of your event. They can't be scheduled, so set a reminder for yourself to place a new module every 30 minutes. 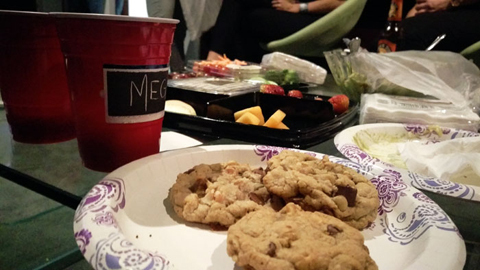 If you really want to go all out: decorate, serve a themed drink, use your projector to stream related videos. There you have it: a Pokémon party at your venue. You are not too late to use this game for your business! Pokémon has brought a new twist to in-app marketing - you’re sharing goods (like Lures) and adding value to customers (like Trainer Levels) in a virtual space (Pokémon GO), while advertising on the ground. The Pokémon Go community is still an expanding variety of people. What better way to increase your customer base, personalize your venue, and build a rapport with existing and potential event-goers. Spend 99 cents and attract new customers, or keep them entertained during your show! 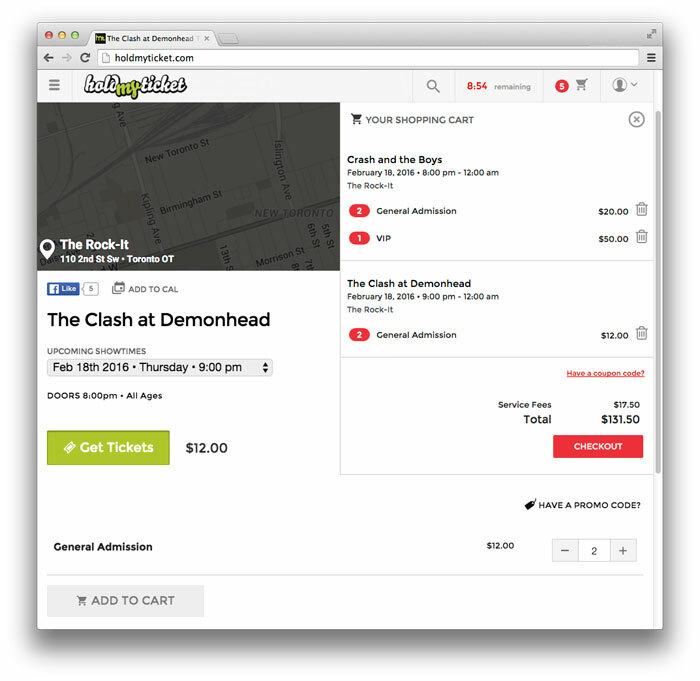 Customers can now add tickets to their cart and continue shopping for different events before checking out. After adding tickets to your event to their cart, they'll see the option to proceed to checkout, with some of your events recommended below. If you don't have any more published upcoming events, they'll be directed straight to checkout. 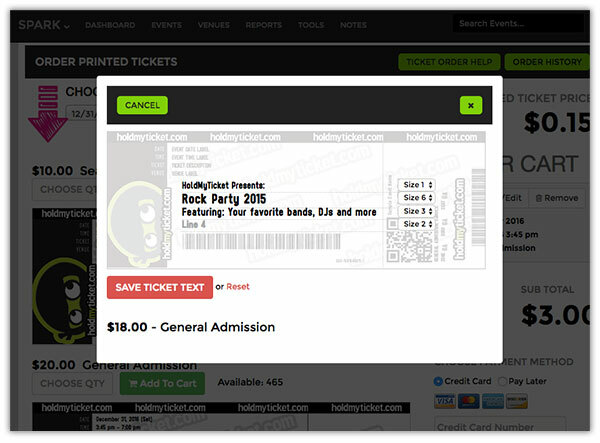 Users can continue shopping around, add more time to their cart and edit its contents from any page on HoldMyTicket.com. Now that users can shop to their heart's desire, transactions occur per venue. That is, if they're buying tickets for multiple events, especially for events at different venues, they can choose their preferred ticket delivery method for each ticket type, and be charged separately for each venue, while only submitting one purchase. Charges that occur on HoldMyTicket will be transparent and easy to understand. Before submitting an order, a user will see the amount they will be charged, plus the way the charge would appear on their bank statement. 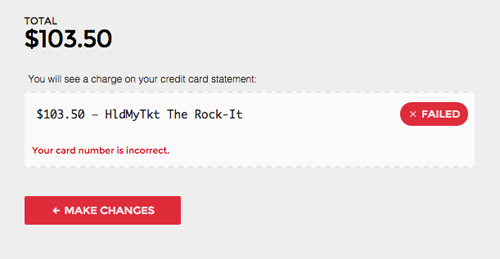 If you utilize HoldMyTicket's Stripe merchant account to handle your online sales, a credit card statement for tickets to your show would appear as "HldMyTckt - your venue name." *Note that while this will affect the credit card statements for most users, it will not necessarily be effective 100% of the time. The customer's bank has the ability to override the way that a transaction appears, regardless of the settings you choose for your own merchant account. The new design includes an image header at the top of your page with your flyer to the right. A user can see the event description and select their tickets all on the same page. The header will use the background image you upload in event settings in Spark, under the "Event Page" section. If you don't upload an image here, it will take the default Checkout Page Masthead you have uploaded in your venue settings, under Branding/Identity, giving all of your events at your venue the same header image. If you haven't uploaded an image in either of these places, the event page header will give a map to your venue. Any errors that might occur at checkout - a missing required field, invalid billing information - will give users an easy-to-understand error message to help them quickly solve the problem and get their tickets. The new interface now offers upselling like it never did before, and it keeps users looking at your events. To manage which events you upsell and when, use the new Promoted Events tool in your Event Overview. Choose specific events to be presented to your ticket buyers, and choose how many. 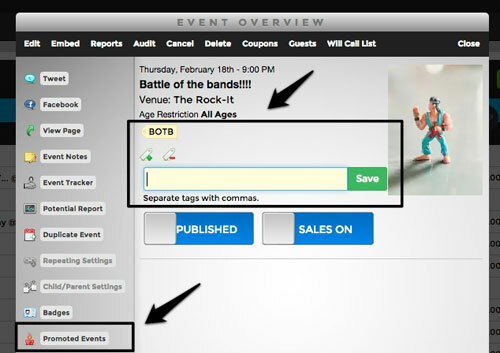 Otherwise, upsold events will simply be organized by tags, which you can also take care of in your Event Overview. Seating charts now enable full screen view. On both Web and mobile, users can make no mistake in understanding your venue's arrangement and choosing the exact tickets they want. Now a user can click into one section then click straight into another without having to zoom back out. Selecting seats places tickets in a drawer on the left, where the user can choose the ticket type they want, if you have set up different ticket types (such as child, adult, or member rates) to apply to the same seat. No more impossible-to-tap seats on the mobile site. Mobile users can pinch and zoom on their screen to make that seat as big as they need in order to tap it. 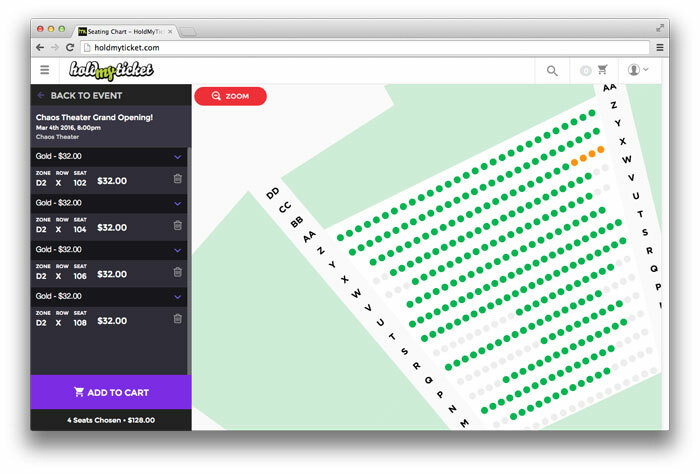 Reserving seats is also more reliable: Browsing and clicking seats does not claim a seat until clicking "Add to Cart." When you have multiple people using your seating chart at once, as soon as one user adds a seat to their cart, that seat will disappear from view for all other users on that page. Try it out, let us know! As always, nothing helps us more than your feedback. 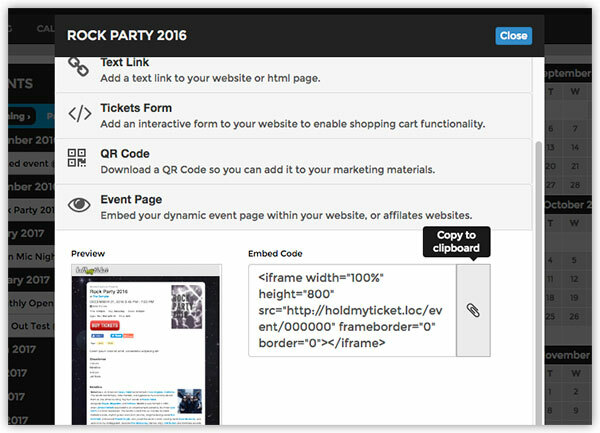 We are excited to apply our new design to your event pages and improve the overall experience on HoldMyTicket. We owe our knowledge and development to the needs of our users, so keep helping us help you! Nov. 14's UFC 193 matchup with Albuquerque's own Holly Holm and (then) world champion Ronda Rousey made our hometown explode with excitement and "burque pride." 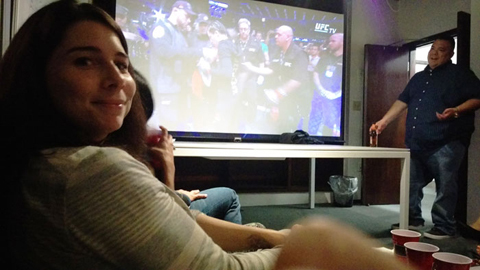 Nothing excites burqueños more than food, beer and a win by one of our own that changes UFC history! That same night, the Sunshine Theater had a show just a few floors below our office. You can usually feel any noise as mild as a sound check when a show is getting started, but when Rousey took that end-all kick to the head, HMT shook the building. Holly's name will be chanted around this town and our office for a long time! Spark is now Mobile Friendly! Whew! Its been a long time coming, we finally made SPARK user friendly on your mobile device. Now you can get reports, edit tickets, and manage all of your events from your phone without pinching and zooming or yelling and screaming. Take a look at your account on your phone, we think you will be pleasantly surprised. We made some slight modifications to the mobile eTicket allowing for faster loading, better readability, swiping between multiple tickets, and optimized size of QR code. Next time you see a customer come in with a mobile ticket, be sure to take a look! Now you can easily toggle the scheduled event announcements and on sales within your view of your upcoming events. Just toggle the buttons in the upper right of the list to see when things are going to be announced and sales are turned on. If you have created internal notes within SPARK, they will also show here as long as they have been tagged with a date. This is really useful if you want to create reminders for upcoming events and tasks. We fully revamped and organized our user guides making it easier than ever for you to learn about our latest features and best practices. The search feature is a great way to find exactly what you are looking for. We plan on adding more and more guides as we can. Please feel free to request new user guides you would like to see. Go ahead and take a look at our Docs to learn something new! We are excited to share our new video. 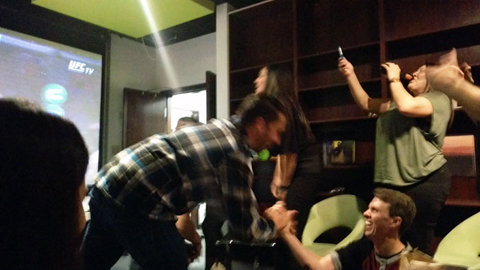 We feel it shows the culture and type of company we have become over the years. We want to thank all of our clients for the support and encouragement. Thanks to the guys at Marble Street Studio, they did a fantastic job!